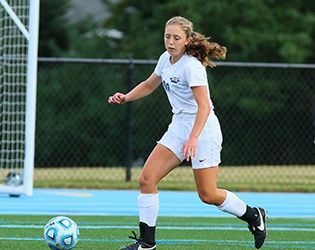 A goal from Amelia Kirby '18 off an assist from Teresa Zimmer '20 gave varsity girls' soccer a quarterfinal win over Timothy Christian in the NJSIAA South Jersey, Non-Public B tournament this afternoon. The girls will face Holy Spirit School in the semifinals on November 8. The game will start at 2:00 p.m. and be held on the Holy Spirit campus in Absecon, New Jersey.